It was 1912 and Åkarp was just blooming. 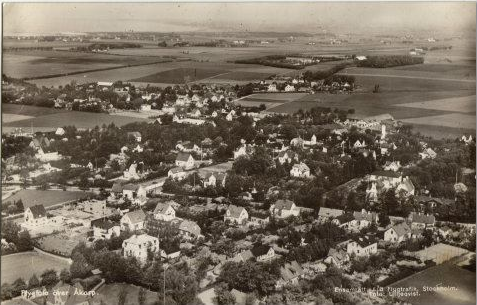 The main streets, Alnarpsvägen, Byvägen and Kullavägen were getting populated with grand villas. The location was, as today, very appealing - afterall, Åkarp is just in between Lund and Malmö. 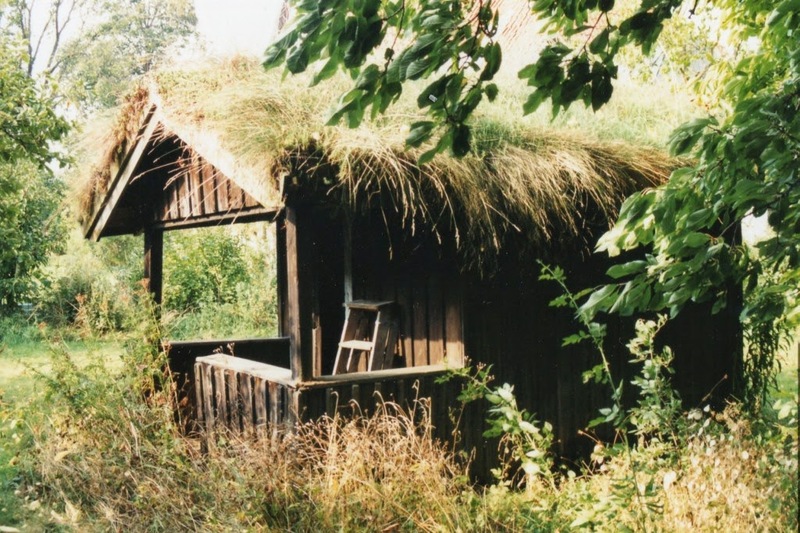 On the southern part of Åkarp, Fritjof Hazelius (1882-1963), one of the teachers at Hvilan Folkhögskola and writer, built his own villa, Hasselagård. He entrusted the danish architect Ivar Bentsen (1876-1943) for drawing the building. It is an interesting detail that Hazelius was author of a magazine for building care (Tidskrift för HEMBYGDSVÅRD Årg.1920 - 1932) where the focus was about building art and environment, for example. He was also relative with Artur Hazelius, who founded Skansen, in Stockholm. 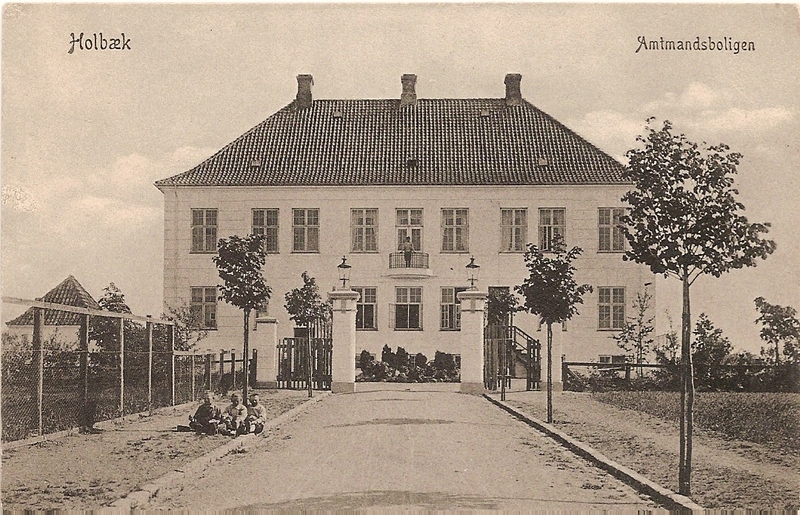 Bentsen was mostly working in Copenaghen, teaching at Kunstakademiet, but he was also the architect for some of Hvilan Förlhögskola buildings (Högahus - the high building - and Västerhus - the western building). 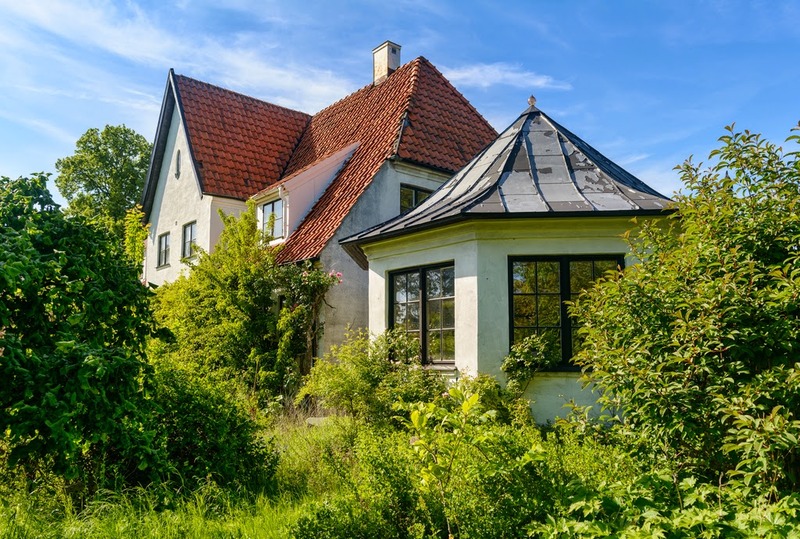 Typical for the period and the architect is the pitched roof and clean lines. This was in line with one style which was strong in this period: with the war approaching building fancy villas was less fashionable and simplicity was preferred. 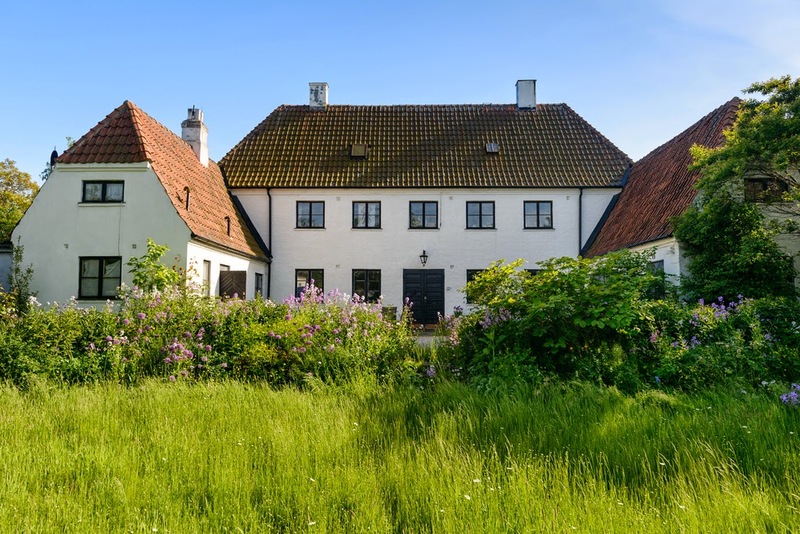 For sure, Hasselagård is a majestic mansion, indipendently of the architectonic style. Why it is called so it is not certain, but there is possibly a connection with the parish of Hassela in Hälsingland. 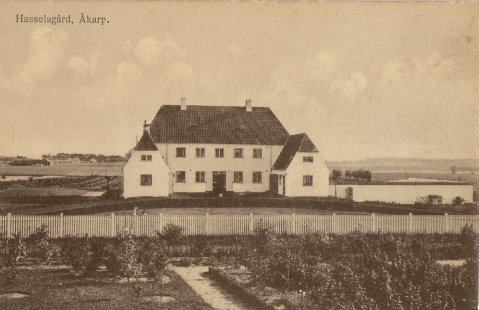 Back in the days, it was dominating the southern part of Åkarp, with about 22000 m2 of area which was possibly populated by an enourmous orchard. Today, the property is "just" 4349 m2 and there are still plenty of fruit trees and bushes that can provide some fruit supplies. The vegetation has just gone wild, though, since the last owner died at 93 this March. Gottfried Kockum moved into Hasselagård after having been studying and working in the USA. There, he was with his wife, Birgit Way Matthiesen. He first studied at the Harvard Graduate School of Business Administration and then worked in several banks. 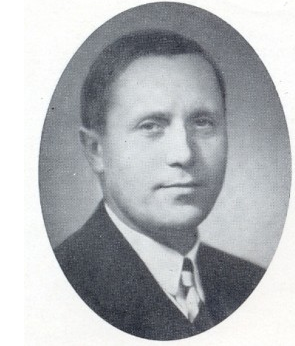 1923 he went back to Sweden and landed in Hallstahammar until 1943. He moved then to Åkarp since he was working as manager at Kockums Mekaniska Verkstad in Malmö. 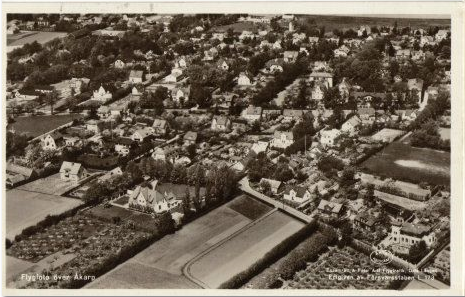 Hasselagård during the 50s most likely, on the lower part of the postcard (ref1). It is most likely at this point in time that the building simmetry got broken. Looking at two postcards (ref1 and ref2), although it is really hard to see the details, it is possible to see a serie of differences in the building. In ref2 (which is the oldest picture) one observe many windows on the top floor right wing, there are no niches on the roof on the southern side and there is no balcony on the right wing. All these details are change in ref1 and they are still there today. When looking at the building from the front side, one get disappointed by that little extension on the left side. Today that hosts the kitchen and possibly, the kitchen has always been there, since in the first postcard from 1915 it is possible to see a little chimney on that roof. 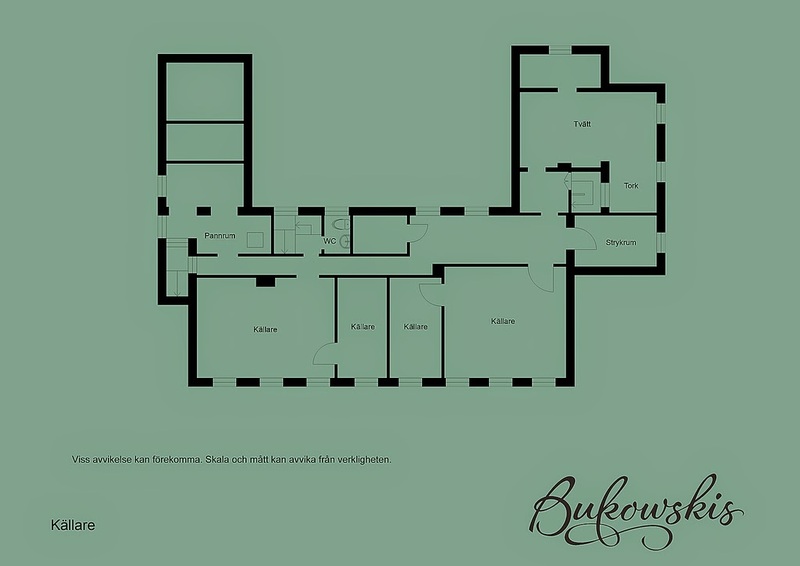 The fact that the amount of windows has changed leads me to believe that there were more rooms where today there is a big master bedroom (it seems the mansion had 18 rooms when Kockum moved there). Which makes sense. The stairs that lead upstairs from the kitchen didn't go to the main bedroom, but to the maid bedroom. More, there was an extra door (visibile in the floor plan still) which would have a purpose only if the master bedroom was not a gigantic room. Kockumsområdet took part of the land that was south of Hasselagård and most likely belonging to the beautiful orchard that can be seen in ref1. The area was planned 1958 and it was Gottfried's Kockums Mekaniska Verkstad that asked the permission to build the 63 houses there. Kockumsområde, 1965. Hasselagård is visilbe on the center right (ref3). On the old area belonging to Hasselagård, Kockum built also an house (Kockumsvägen 10) where he moved (the house is visible in front of Hasselagård in ref3). He died there, at the age of 76. 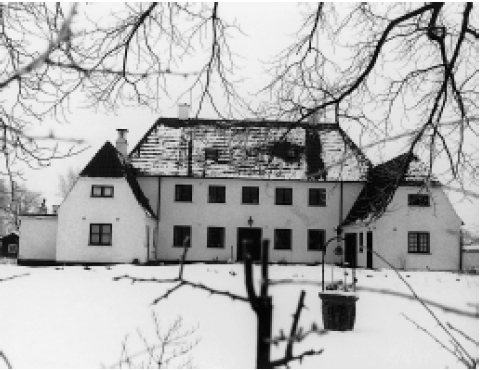 His wife instead continued to live in Åkarp until 1989, but her last days were at Åkarpshemmet (the hospice Harakärrsgården). It's 1968 when Gunda and Nils Nielsen move to Hasselagård. Back then, they did a total renovation. Most likely they renovated heavily the kitchen and the bathrooms. 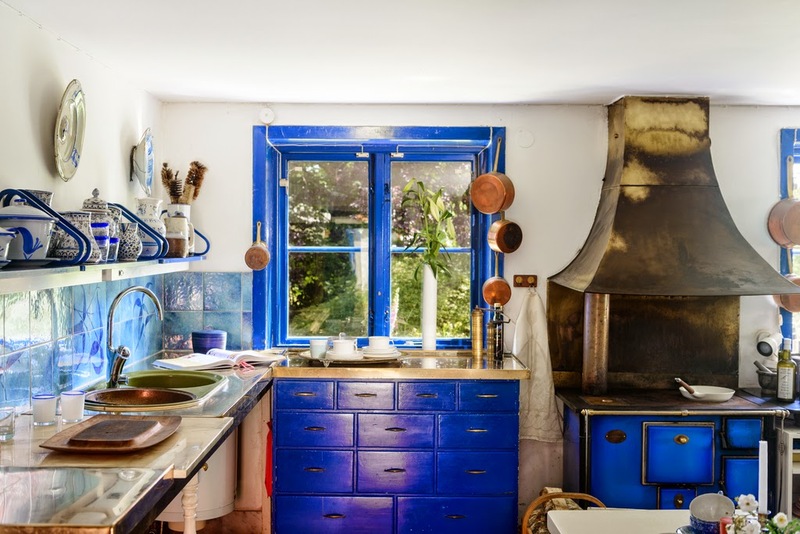 The kitchen shows sign of an attempt to be traditional, but has a questionable electric blue color which I have also seen in the 70s style pantry of Villa Bellevue. The main bathroom is up next to the master bedroom. My guess is that that room back in the days was the maid room - and simmetrical, opposite to it, there must have been the gardener room (a little, tiny, cute staircase goes out of that room, down in the heart of the garden). But this is just my guess and fantasy. Today the bathroom is far from being modern. The water heater is a very interesting machine connected to the tap of the bathtube and pipes are running through the room in a very peculiar pattern. No one has had the time to fix a banister to the improvised balcony - I suppose this is a confirmation that the couple didn't have kids. Tretex has though not been removed from the walls (probably, it was installed in the 40s). Nils (Niel?) 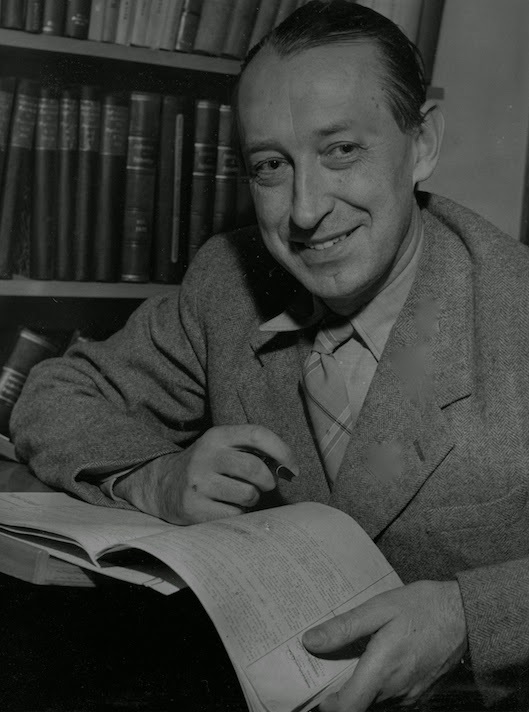 Nielsen moved to Malmö 1955 after working in Copenaghen under intense stress and was Skåne first and only psychoterapist for a decade. Together with Elise Ottesen Jensen he founded RFSU (Swedish Association for Sexuality Education) 1933. In Göteborg, 1948, he met Gunda who became his third wife. Later, when in Malmö, she worked at Malmö Stadsteater as speech therapist (at that time, the theatre director was Ingmar Bergman). They worked then together in the psychotherapy field, hosting also their reception in Hasselagård. They both loved travelling and that is clear also by the furniture that is spread all around the house. Kimonos and beautiful exotic textiles are hanging on the walls, mixing old and designed furniture with more than few pieces in oriental style. After Niel's death, Gunda kept living in the house. I can imagine she loved her garden and she had a passion for flowers and I wish that her efforts will be respected by the next owners. When walking in the overgrown forest that the garden is today, one can see beautiful flowers peaking out from the high grass and the weeds. The house was enriched by plants and there are traces of more plants also in the basement. My guess is that they were resting during the winter ready to be taken out for the spring to come. Despite living on her own, Gunda decided to modify once more the floor plan of the house, adding to the "kitchen wing" an octagonal building. Beautiful in its shape and filled with light, but sadly, not mixing properly with the original style of the mansion and badly connected inside with a threshold between the original floor and the one of the newest part (underwhich there is water based floor heating). 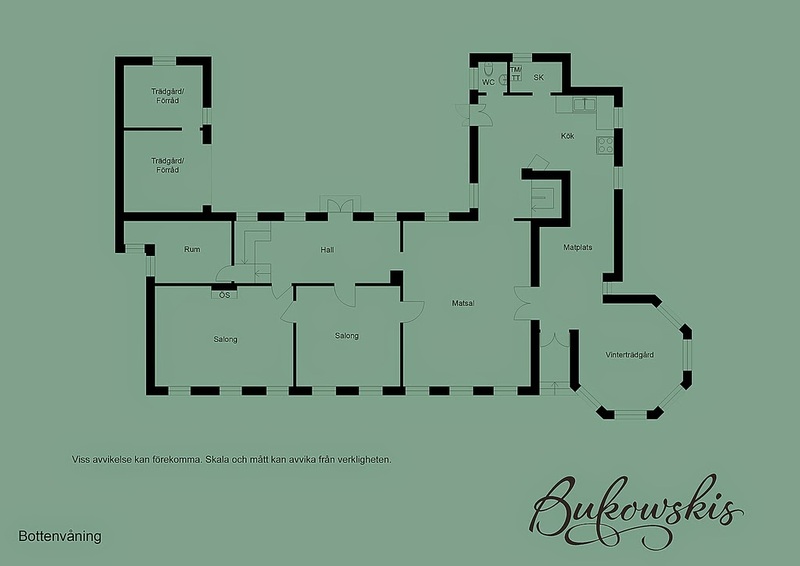 The first floor is dominated by big rooms for the "social activities". Even though the rooms are quite big, one detail that struck me was that the ceiling is quite low for being such an old and grand building. Precious wallpaper, often torn with humidity stain, decorates the dining room and the living room. Details from another epoch are still visible in the joinery. An harmonic staircase leads to the basement and to the second floor (and even to the attic). 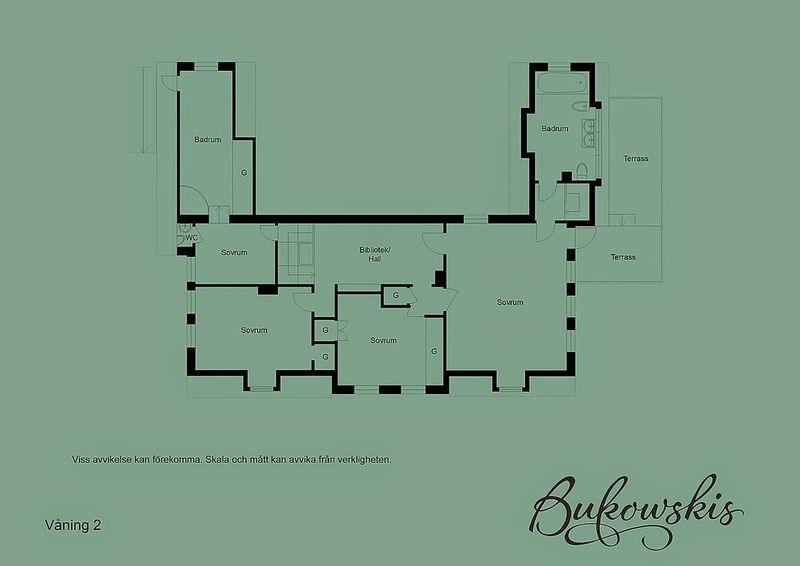 The second floor is enriched by a beautiful dressing room, with a niche and an enormous bedroom. Sadly, in my opinion, it is clear that there has been some heavy modifications in this floor and the atmosphere is closer to the 60s than "another epoch". But of course, it is also a matter of taste. Basement and attic are typical for these buildings. The basement is humid and the attic is ventilated. In the basement it was also possible to see in the laundry room and old basin where clothes where washed and an oven. The rooms are spacious also there and the floor is very beautiful for being a basement. A lot of old books (and plants) give a very peculiar smell to this storage place, where a very energy consuming oil boiler is occupying one of the rooms. When passing Hasselvägen today it is hard to spot the big mansion. Instead of the beautiful white fence, one is discouraged by an enormous beech hedge. Two wooden white gates are still the "official" entrances to the area, but one of the paths in the garden is completely hidden in the grass. There is also a mysterious metallic gate on one corner and instead of using the gate, one can go directly in the garden by passing next to the garage. The building is near the road and there is no fence between it and the gate. But by walking on that path, it is finally possible to observe the beauty of the massive white building, which hopefully will end up in the hands of some "old buildings" lover and won't destroy the soul of this beautiful mansion.